After nailing down its heavyweight title main event, UFC 211 looks to find the possible next contender for the belt when Fabricio Werdum faces Ben Rothwell on May 13th in Dallas, Texas. After getting a main event earlier in the week, the rest of UFC 211 might finally have fights starting to roll in. Now two heavyweights who have grown a bit of contempt for each other will likely face off to get one step closer to facing the winner of the night’s main event between Stipe Miocic and Junior Dos Santos when former champion Fabricio Werdum faces Ben Rothwell. This bout was originally scheduled to take place last September, but Rothwell was forced out with a knee injury and Werdum faced Travis Browne instead. 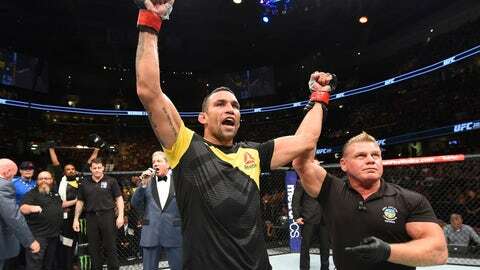 Fabricio Werdum, who has not been in the promotion’s good graces recently, felt wronged by being passed over for a title shot in favor of Junior Dos Santos. Werdum faced Travis Browne in a rematch in his last outing and bested him once again for a decision. After that, Werdum was supposed to rematch Cain Velasquez, but Cain was unable to get clearance to fight, leaving Fabricio without an opponent. With one more win, Werdum will look to reclaim the belt that he lost in brutal fashion to Miocic last year. Ben Rothwell was on a tear in the heavyweight division before being shut down by Junior Dos Santos last year. The loss interrupted Rothwell’s four-fight winning streak of all finishes, including being the first to submit Josh Barnett. The injury that forced Rothwell out of the Werdum matchup last September sidelined him longer than Rothwell wanted, and by asking for this fight for a while now, he’s hoping he can get himself into the title picture once again. Already at 35 and being around the game for a while, his time could be running out. UFC 211 will take place on May 13 in Dallas, Texas. A heavyweight title bout between Stipe Miocic and Junior Dos Santos will headline, with Werdum vs. Rothwell not too far underneath. No other fights have been scheduled for the card yet.